Sitting on our sofa, looking out at the half-naked maples, it’s clear that Black Thursday and Christmas in Freeport are not far down the calendar road! If that wasn’t enough, the near freezing temperatures and the annual Sunday River Fall Festival are serious indicators! A little research quickly reveals that the upcoming season presents some special seasonal opportunities in both Portland and Bath, as well! Emerging as a promising early newcomer in this arena is The Early Bird Sale (created by Reny’s). The idea is to offer BIG DISCOUNTS ahead of Black Thursday on the first Saturday of November (11/1), to give you an earlier reason treat yourselves to Brewster House, while you reward your “up & out” spirit with DEEP Christmas savings. Many local merchants (as well as in Bath & Portland) will offer a structured set of storewide savings of 40% off at 6AM, 30% at 7AM reducing to 20% at 8AM!! As I speak, we have 2 rooms that just opened up that weekend from a cancellation!! They won’t last! What can we say about Black Friday?? Respecting our family desire to enjoy the special opportunity to enjoy each other on Thanksgiving, we will not be open to guests until the Friday after, 11/28. Hey, great opportunity to jump on the early Amtrak Downeaster train and relax! It leaves North Station (Boston) @ 9:05AM and gets into Freeport just after noon on Friday. Small Business Saturday is huge for our fellow shopkeepers locally, here, in Bath and Portland too, so please consider the unique products and personal service they offer you this Holiday Season, and patronize them!! 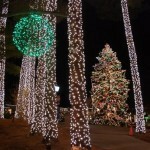 The huge annual Sparkle Weekend http://sparklecelebration.com, will take place starting on Friday December 5th, with a 6PM Parade of Lights on the LL Bean campus, be will be dazzling all on Saturday and Sunday evenings as well. If you’ve not seen it in the past, the display is really amazing!! Santa will be visiting from 6:30 to 8PM. Moving into the weekend, don’t forget the Sparkle Express Downeaster Train Adventure, Old Fashioned Horse Drawn Wagon Rides, Tuba Concert on Saturday, and Jingle Bell Run/Walk on Sunday morning (to benefit Arthritis). Throughout the weekend, LL Bean will also be offering all sorts of Winter sports activities, such as skiing, sledding, snowshoeing and cross-country skiing!! Leave those TV’s and computers home!! December 9th & 10th bring the Festival of Trees to our favorite museum, the Maine Maritime Museum in Bath. There will be a Candy Cane Train from the Bath Station to Wiscasset and back, including Santa & his Elves on December 13th & 14th at 9AM, 11AM, 1PM & 3PM. Although they’ve not yet issued a date, they are organizing an evening of caroling from a trolley. 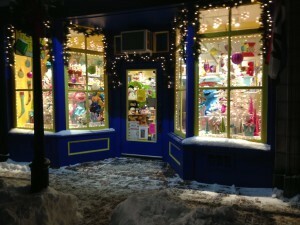 Take in the stunning vista of Christmas dressed 200 year old downtown Bath! You would think Portland (with it’s fine restaurants & long interesting waterfront) would do it up for Christmas, but their event schedule seems a bit understated… Their website starts with the Annual Christmas Tree Lighting on Saturday 11/29 @ 5:30PM, including entertainment by Rich Charette and the Bubblegum Band. Wow, huh?? Shop for a Cause day occurs the following day, wherein a portion of the proceeds go to local charities. On Thursday, 12/11, 5-10PM the 12th Anniversary Merry Madness (or Shop Till You Drop) will happen in the City. Horse & wagon rides will be offered on Saturday and Sunday afternoons during Holiday Season, from Monument Square on the ½ hour. Finally, artist Pandora LaCasse will create a standing display of radiant holiday light sculptures throughout downtown from December through February. For updates and more information, see www.portlandmaine.com. We still have a room available for Sparkle Weekend and more availability for the weekends on either side of December 6th!! Stumped about what to get for a gift for that loved one who has plenty of stuff?? Buy them a good time, a gift certificate for a fabulous Brewster House Escape!! They’re available on our website, or feel free to call and we’ll get that to you quickly. As we continue our Visit Maine Like A Mainer! series, we come this week to Maine’s Mid-Coast region. 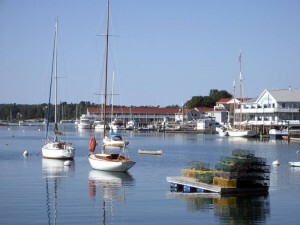 Some of Maine’s top destinations are located here, including Camden, Rockland, Boothbay Harbor, Wiscassett, and more! Venturing north from Brewster House, we first come to Brunswick, home of Bowdoin College whose famous connections include authors Henry Wadsworth Longfellow and Nathaniel Hawthorne, Civil War general Joshua Chamberlain, and arctic explorers Robert Peary and Donald MacMillan. Heading toward the coast, you find Bailey Island and Orrs Island, with scenic points and cottages. North on US-1 is Bath, with antique shops, the Maine Maritime Museum and Bath Iron Works, one of Maine’s largest employers. 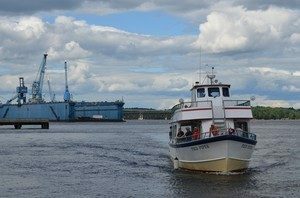 Driving to the coast from Bath you’ll find parallel state parks on opposite sides of the river, Popham Beach, with its Civil War fort, and on Georgetown Island, Reid State Park, with its rocky crags and sand beach. Five Islands, with its “10 best” lobster shack is nearby. Driving north on US-1 from Bath, you come to Wiscasset (home of Red’s Eats, another “10 best” lobster shack), then the Boothbay region and Boothbay Harbor with its shops, ships and vistas. Returning to US-1 you’ll find Damariscotta and the Pemaquid Peninsula – one of Maine’s best kept secrets (thanks to @squashbuckler and @walpolebarn for mentioning this). 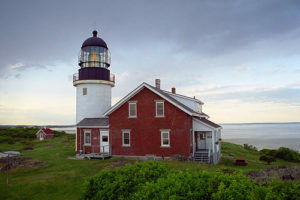 Besides the magnificent Pemaquid Point Light Station, there is New Harbor and whale watching tours, a coastal drive along Route 32, and Shaws, yet another “10 best” lobster shack. Returning to US-1 you’ll find Waldoboro and Moody’s Diner, Thomaston (home of George Washington’s Secretary of War, General Henry Knox) and its quaint houses and the Maine State Prison Store, and Waterman’s Beach Lobster (another “10 best”), then down the peninsula to Port Clyde and Marshall Point Lighthouse. On the way back to US-1 stop at Owls Head Lighthouse to admire to view over the hilltop to Penobscot Bay. Next is Rockland and its breakwater lighthouse, and the Farnsworth Museum, then on to Camden and its wonderful views of the beautiful harbor, schooners, and its shops. Try the view from Camden Hills State Park for a truly majestic scene! 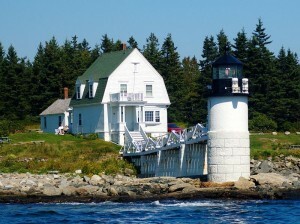 A vacation in itself, your visit to Maine is not complete without at least a day trip to Maine’s Mid-Coast region.